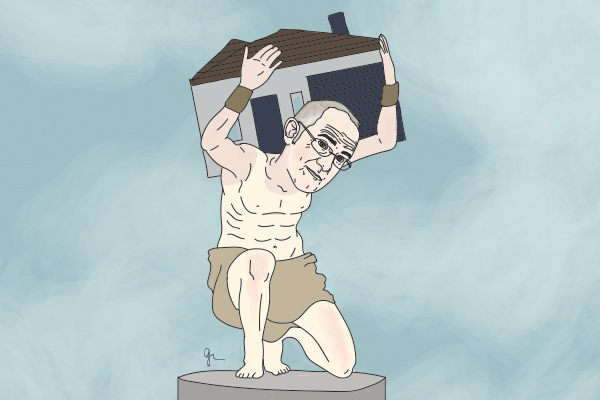 Phil Twyford cartoon by Jacky Carpenter. Both the Housing and the Finance Minister have thrown their support behind the Acting Prime Minister’s long-term goal of getting house prices down to five times income. But, like Winston Peters, they won’t say house prices should fall – instead, they are relying on a significant increase in average wages to reach the target. Speaking to reporters at his weekly post-cabinet press conference on Monday, Peters said he wants to see house prices at no higher than five times income for young home buyers. The most recent data shows the median house is valued at just over six times household income as an average across the whole country. But that number rockets to more than nine times income when looking at Auckland alone. Finance Minister Grant Robertson says it would take “some considerable time” for house prices to reach five times income. But to get to that level, he says wages would need to rise and the increases in house prices would need to soften. He says the Government is working on several ways to accomplish this. “KiwiBuild is, in large part, an attempt to increase the supply of affordable houses by building more modest starter homes that are not currently being built in the private market. Speaking to media on Tuesday, Peters went even further than he did the night before, saying houses should cost no more than five times the living wage. According to Living Wage Aotearoa, the current living wage is $20.55 an hour. “But remember just a couple of generations ago, a single income household on an unskilled wage could afford to buy their own home, raise a family and pay that home off in the space of two or three generations. "But remember just a couple of generations ago, a single income household on an unskilled wage could afford to buy their own home, raise a family and pay that home off in the space of two or three generations"
A couple of generations ago it took two to three generation to pay off a family home, so that means those families are just finishing paying those loans off now for great granddad?! With the feminist education we have now and the way university enrollments are going, the single income of the future will be from the wife. That's good, gendered equality is defiantly what we should be aiming for as a society. Not sure how that relates to generational loans though? Are you implying its good because women are now better equipped to pay off the houses of there grandparents two generations ago? If so, your missing the point a bit there. And keep in mind that the average house price can fall with no affect on existing home values if more affordable dwellings are built. It is possible to lower the average price without anyone taking a haircut. You may have to better explain this paradox you have discovered.. I think Jimbo there is more like Pandora's box than a paradox nymad, you might want to leave that closed. Looks like Jimbo has invented a parallel universe where the over-geared ostrich can go and bury its head in sand and not get eaten alive from the shoulders down. Here is an answer for this paradox. let's imagine there are 100 houses all with CV of 1 million. At this point, the average house price/cv is 1 million. Now, assume that Kiwibuild adds another 100 houses and the CV of these houses are 500K. I'm sure you can compute the average which is going to be lower than 1 million without decreasing the CV of million dollar homes. Cheers. There are estimated $1.8m private dwellings in NZ (from Stats NZ), and an average value of $678k (QV). Add 100K of Kiwibuild at the low end of 500K and you have dropped the average by 9k to an average house price of $669k. That will be less if you build too may of the Auckland 650k houses. Just for scale, you need to drop the average house price by roughly 80k move the ratio from 6x to 5x. Point is this will take generations if we are only building the 100k and increasing minimum wage. We need to sort of building cost and wage growth for everyone. There are some strange effects when affordable housing comes via intensification. The upzoning that creates the possibility for intensification adds value to the property. But if the intensification is large enough, like 1 house becomes 5 houses then those extra houses can fall in value in comparison to existing houses. So this means for existing houses are facing two effects. Rising upzoning values for existing homes against falling values from more competitive new homes. Seems rational. One feature I like about Auckland North Shore is the continuing existence of small shops - mainly dairys and fast food and liquor and the occasional laundromat. My US relatives found the existence of small shops the most amazing feature of Auckland. Compare with the UK where in most towns and cities they have closed. Well in Auckland all the sub-divisions has meant increasing density counter-balancing the competion from shopping malls which has left most of those shops open. It can be contrasted with the empty shops in NZ small towns where population density has not changed. We are going to see a lot more 2 beddies stacked upon and next to each other in the future. Design is going to be crucial. The government probably needs to put the countries best architects on the payroll. Minister request to walk the talk on election promise. Why diluting ban on foreign buyer amendment bill and to do it are trying to play with time and delay behind the process as unable to backtrack. I suspect there are probably many more complexities around “banning foreign buyers” than just making an announcement, printing out a 1 page memo and rubber stamping it. You’ll probably find there’s plenty of pre-existing legislation with contents that are contradictory of a foreign buyer ban so they need to iron that out. All 3 have lost the plot and are all totally irrational, and yet they are running the country? If wages go up then the price of houses are going to go up due to all the components involved in housing costing a lot more due to the increased wages. Seriously does anyone still believe these comedians are capable of running NZ? After the previous 9 years, even zero is a win. I think these guys completely lost the plot. It's easy to make these statements, 5x income and living wages folk to afford a house in Auckland. That makes it $200k houses. I would literary buy 20 houses tomorrow at that price and retire. They clearly don't understand demand/supply and market. When will the common folk realise this and that we voted in a bunch of idiots non-commercial people to run this country. BTW what's happening with foreign buyer ban. Thought was supposed to be in by now!!. Delay tactics as can't get around free trade agreements. Probably ffn lawyers making money trying to get around it. Stopped holding me breath on this one. Not only this nonsense but they are stopping gas exploration so NZ will become much poorer in future. Clearly you are a Greenie. No idea of how the rest of working NZ pays for your unemployment benefit. You clearly believe this BS your Greenies and labour sold you. Let's see if they do anything more than the previous govt did for NZ environment. Maybe you should think about getting a university degree for a start and getting a job before worrying about house prices coming down. With a low pay you won't be able to afford a house in Auckland even if it halves. I can make out all this about you from your idiotic blogs. Haha you loser.. an assumption making chimp.. you sound lousy and am pretty sure a lousy creature in our society..
Im proud of my education, unlike you who has to create a lousy name to make yourself feel good.. If Houses-Overpriced shaved off his dreadlocks, ditched the rainbow stripe baggy pants, sold his unicycle and stopped wasting his days balancing on a slackline tied between 2 trees at the local park he might have a job and houses won’t be overpriced. You muppet see my challenge to CM, take up the challenge. Are you two a pair or again fake accounts. I scrub toilets for $16.50 an hour you win. It's not about winning. In fact if that is really what you do, I would respect you more than someone in a white color job. It's "white collar job" you imbecile, not "white color job". Shows your level of intelligence. Which electorate you standing in for labour next time. You got my vote just for entertainment value. OK you whanker, I admit my typing error. .
Why so angry dude. You live in the best City Auckland and country in the world. Just chill, maybe change that name as it keeps reminding you that you can't afford a house. I don't intend to be rude, it's just when some of you pass ridiculous statements is what gets me. .. If house prices could jump 200 % over the last decade, what's wrong with them coming down. . I come for the article but I stay for the outrage. Yeah outrage from you guys who are drowning in debt and realize how foolish you'll were /are. . It's not what I do, funnily enough I do work a white collar job. You seem to have an incredibly high opinion of yourself there "Chessmaster". Please let us know your degree, job and salary so that we may bow to your magnificence. Mate if he can fake his name, he'll fake anything to prove he's a success. . The MBIE advice would seem to contradict your assertion. "I think these guys completely lost the plot. It's easy to make these statements, 5x income and living wages folk to afford a house in Auckland"
They wouldn't allow this sort of thinking in China now would they Cheesy? What a thought, social justice and the idea of some opportunity for people outside the party to own their own home? How rong before Aucrand is ours? All that being said I think we need to invest some more time with that English as a foreign language coach because the construction of your sentences has deteriorated again this week. How about I book something for Thursday and then hopefully you'll be able to get your point across in a way that doesn't sound like you may have a bit too much of a vested interest. I know you liked the ray buyer policy was when Chong Kee was preparing to sell out the country and his house. Is that what you plefer? Haha ... obviously once it gets past 6 pm, most idiots finish dinner and are out on their daily chores of cheering the losers for whatever BS statement Du jour was thrown around during the day ..lol. Yes Gents, time and again, NZers are reminded that some of them have voted into office a bunch of idiots who keep insulting our intelligence everyday, -- and making us the laughing stock of the world! These guys are so thick skinned that they could blatantly throw out such nonsense comments and statements in public with a straight face no matter how laughable they might be. .... lol, 5 X living wage huh? ...a $200K home ? sure !! Why not ?, anything is possible ... but of course that might be possible in 2056 or 2058 ... after WWIII perhaps ! ... Or with the advancement in Nanotechnology ... to build nano prefab houses on few meters of land !! .. costing few nano dollars per square nanometer to build. There is no point in discussing anything this Lot says - logic and common sense apparently have left this Gov when this CoLs assumed power last October ... What a shambles? I guess they know that their days are numbered and they have no alternative but to keep pushing the proverbial up hill regardless if they insult the intelligence of most common NZers ( at least those who pay attention to them). The big Bribes are saved for 2020 to fool whoever is left supporting them. Until then, the melodrama continues - with the obscene scenes of naked emperors' daily parading in public , ... becoming a R13 circus really ! Bla Bla Bla. Who let you out of the dog house. . Bet your back side burns to see your mates have let you down. .
HO, seriously you defend everything that this government come out with, even though very little of it is sensible. What is your agenda, everything that comes out of your mouth is BS and how on earth you can possibly continue to come out with the shite you do as it must be very tiring! How on earth can you believe that house prices are overpriced when people are still buying them around NZ. Just because you can’t afford to buy one, doesn’t mean that they are overpriced!! For you yes but for others NO! Shut the heck up you fool. Read and educate yourself on housing affordability in nz. Who voted you into elected office? Maybe winston has just seen the movie 'Downsizing " ???????????????? Reading these threads from afar in Noosa has me wondering whether the moderators are on holiday as well. So much adhominem going on that Taxinda, Twatford, the man some call Political Pus and the COLONZ in general are getting a free ride they don't deserve. Agree ex expat, I only skim read it but its really petty childish stuff guys. Btw I hope you Aucklanders are going to enjoy your traffic commutes even more now 15.5c a litre! When I worked, I took the bus. CBD in 25 minutes for $3.30. I rarely use my car, except for trips to Coromandel and Tauranga. I expect I'll be using Gaspy a lot to keep the oil companies honest as the X5 is a gas guzzler. This is why those who can afford will buy houses in central Auckland and these keep increasing as more people compete for them. Exactly the same experience I've had owning properties in Melbourne and Sydney. Central surburbs are very desirable as population grows. Can't imagine being stuck on northern and southern motorways, it's horrendous. Up until to late 1980's, household medium multiple was 3x income, And the household income use to be just one earner, not two as is common today. There is a hundred and one permutations on how we need to get there, but involves house prices dropping, wages rising, and putting people into smaller and smaller apartments. How this might play out is on a knife edge, because there is much that is outside the 'control' of rational behaviour, more so on how prices could sudden drop and less so than on the deliberate political decision to encourage non productive property wealth creation. It's almost Trumpist in the condemnation and deliberate misinterpretation of what Winston has said and what needs to happen with house prices. Parallel to this happening is the increasing demand for incomes to increase or strike action. These increases are needed to make up for the rampant increase in house prices that have completely decoupled from what it costs to build them. People wouldn't be needing wage increases if houses were at lower medium income multiples. Winston is just stating the obvious. Just as there has been some pain to a certain section of society with the unwarranted increase in house prices, there will be some pain on the way down, until we achieve balance. If interest rates are guaranteed to stay this low for 30 years then there’s no issue. Housing is affordable in its current state if you can make it past the high deposit requirements (in dollar terms). Are interest rates guaranteed to stay low for 2 years let alone 30?